Thai Handmade Ceramic Owl Pendant Necklace, "Alluring Red Owl"
Thai artisan Napat Chotpruekchookul crafts this ceramic pendant necklace featuring a hand-painted owl. The storied owl is symbolic across the globe for its wisdom and can act as a good luck omen. The richly-detailed pendant hangs from a waxed cotton cord that features a sliding knot for adjusting the length. 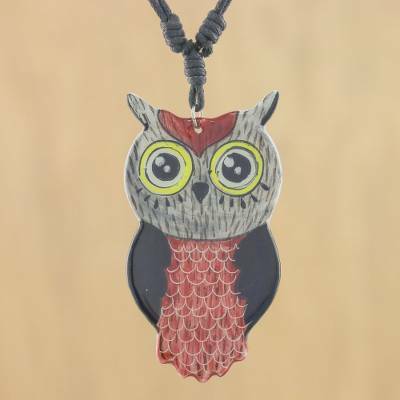 You can find ceramic pendant necklace 'Alluring Red Owl' by Napat Chotpruekchookul in jewelry categories such as Animal Themed Necklaces, No Stone Necklaces, Ceramic Necklaces, Cotton Necklaces and Pendant Necklaces. Enjoy exploring these sections for other Novica treasures.